Date : Paris ca. 1507. Size : 6.7 x 4.3 inches. / 17.0 x 11.0 cm. Description :Book of Hours leaf, printed by Thielman Kerver* in 1507. It is printed on vellum in black and red with many initials hand painted in red, blue and gold. The borders show scenes from the lives of the Saints, but also the Evangelist St. Luke writing with the ox at his feet. At the bottom of the recto we see many animals including a unicorn! *The firm of Thielman Kerver is best known for its lovely printed Books of Hours, many of which include hand-painted miniatures and initial letters. 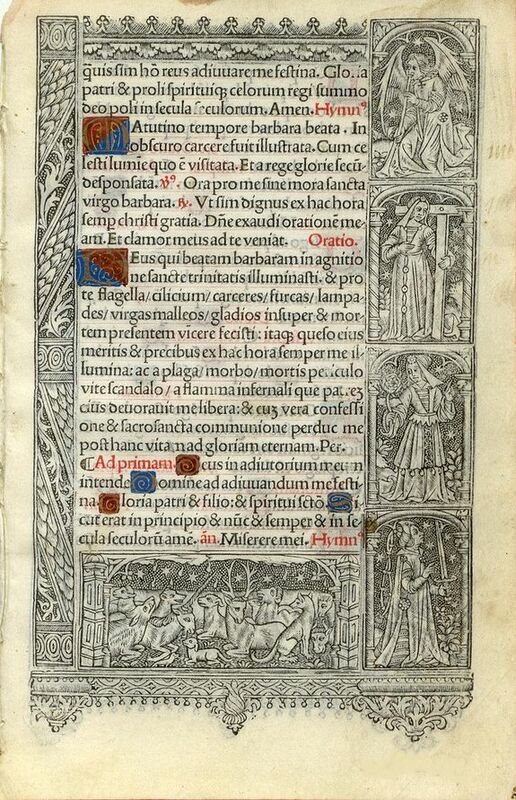 Thielman Kerver, who was one of France's most prolific printers of such books, began printing Books of Hours in 1497, and continued until his death in 1522. At this time, his widow, Iolande Bonhomme, took over the firm, and continued to produce liturgical books of different types until 1556. Brunet notes that even though Kerver printed many different Books of Hours, his work is less common than that of his colleagues, Simon Vostre and the Hardouins. Brunet suspects that is because fewer copies on vellum were printed, and paper copies were destroyed. This may also account for the rarity of the present leaf.